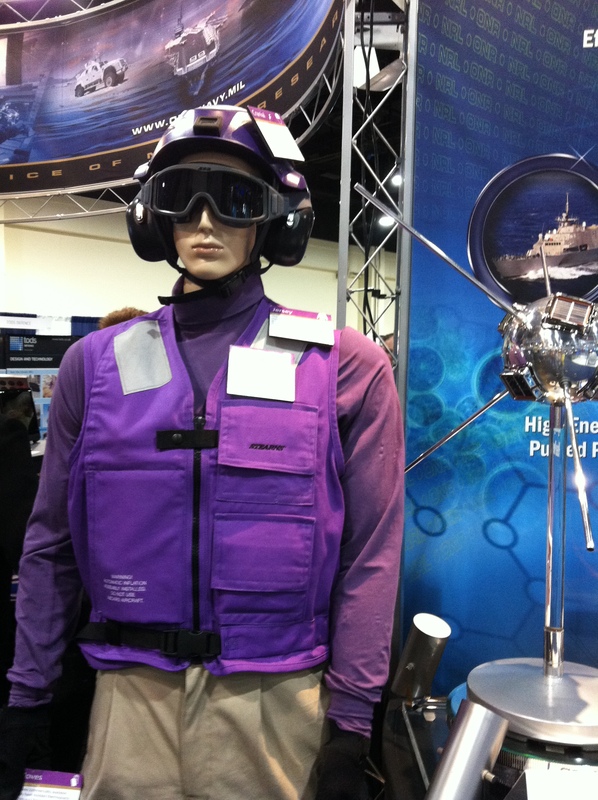 The new flight deck jerseys we wrote about last month are on display at the Navy League’s Sea-Air-Space symposium outside Washington, D.C.
A mannequin is wearing the new jersey, as well as a float coat, gloves and the new trousers at the Office of Naval Research booth. The new trousers have more secure pockets, with stitching to prevent anything from falling out while working. The trousers also fit better and are less expensive to make, an ONR news release said. The new flight deck gloves are commercially available and feature better knuckle and finger protection, increased ventilation and improved fire resistance. They are also more durable and more comfortable. The jerseys, as previously reported, are naturally fire-resistant and designed to wick away sweat, keeping sailors dry and comfortable during hot days on the flight deck. Sailors aboard the aircraft carriers John C. Stennis and Dwight D. Eisenhower are wear-testing the new jerseys, and those aboard a third yet-to-be-named carrier will wear-test the trousers later this year.